Baskets are a great closet design idea! Our wire baskets are available in three widths: 18", 24" and 30". They also come in 3 convenient heights: 6", 11" and 17". Optional liners in canvas or plastic are available. This custom closet design allows for easy organization with various sized wire baskets and shelves at different heights. Baskets, shelves and doors are a good way to organize your closet acccessories and keep them hidden away. 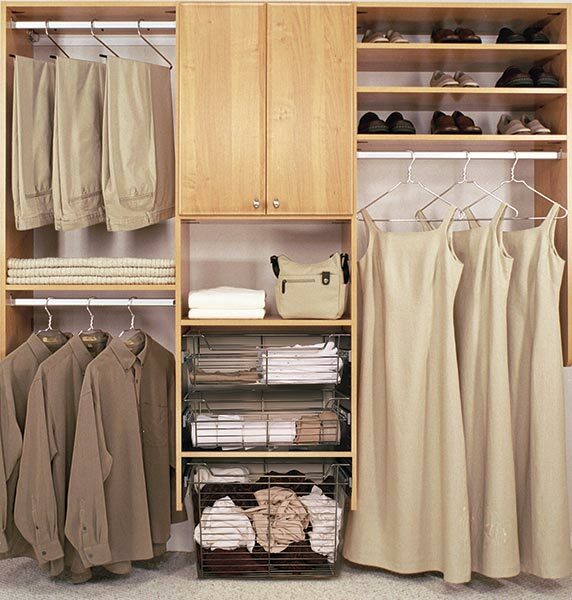 This closet organizing system allows all closet accessories to have a place they belong.